This election prompted me to deeply recommit to my values and the world I want to help create. I know I’m not alone in wanting to live in a world where social justice is a reality; a world that honors women’s diverse voices and lived experiences; a world where people’s health and well-being come before corporate profits; a world based on honesty, fearlessness, and compassion. These values, and the generosity of people like you, are the foundation of our work at Breast Cancer Action. 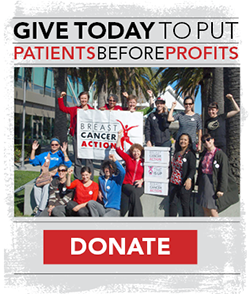 Your support is essential to putting patient interests before corporate profits. Make your year-end donation today. Our values infuse every level of our work, including where we get our money. At Breast Cancer Action, we aren’t in the pocket of any industry. And this distinction makes all the difference in the world. being honest about the harms, side effects and limitations of a new cancer drug versus promoting it unreservedly because of financial or other ties to the pharmaceutical company which stands to make billions. Our independence means we can always put your health before the interests of pinkwashing and polluting corporations. Your donation is an investment in an independent watchdog for women’s health. Make your year-end donation today. Thank you for investing in our work to stand up for women’s health. Your support makes our work possible. ← Thank You for Helping Us Exceed Our #GivingTuesday Goal!